For this month’s Secret Recipe Club I was assigned to Secrets from the Cookie Princess. Colleen is the face behind the words of her blog and…girlfriend likes to bake. Seriously. If you check out her about me section, one of the first thing she tells you is that she baked 163 dozen cookies as Christmas gifts. One hundred. Sixty three. Dozen. Cookies. I can’t even comprehend what that many cookies looks like. Pretty awesome, I’d imagine. So knowing that little tidbit about her, you can probably assume just how difficult it was for me to chose a recipe to make. Scrolling through her recipe archives, I was stopping every 10 seconds to look at a recipe. How I ever made it to the muffins category is beyond me, but when I saw this recipe I knew it was the winner. Of all the muffins I’ve made and ate in my lifetime, I’ve never had ones with pineapple. 1. Preheat the oven to 375. 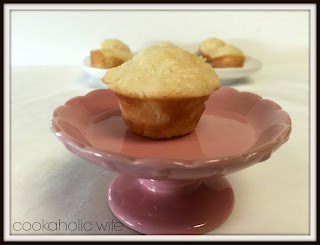 Spray a mini muffin/cupcake pan with non-stick cooking spray or line with paper liners. 2. In a large measuring cup, whisk together the buttermilk, butter, egg and orange zest. 3. In a large bowl, whisk together the flour, sugar, coconut, baking powder and salt. Pour the buttermilk mixture into the flour and stir until combined, then fold in the crushed pineapple. 4. Divide the batter into the muffin pan about 1 1/2 tbsp. to fill to the top. Sprinkle each with sanding sugar. 5. Bake for 12-15 minutes or until the muffins are lightly golden and spring back when pressed. Transfer to a wire rack to cool completely. 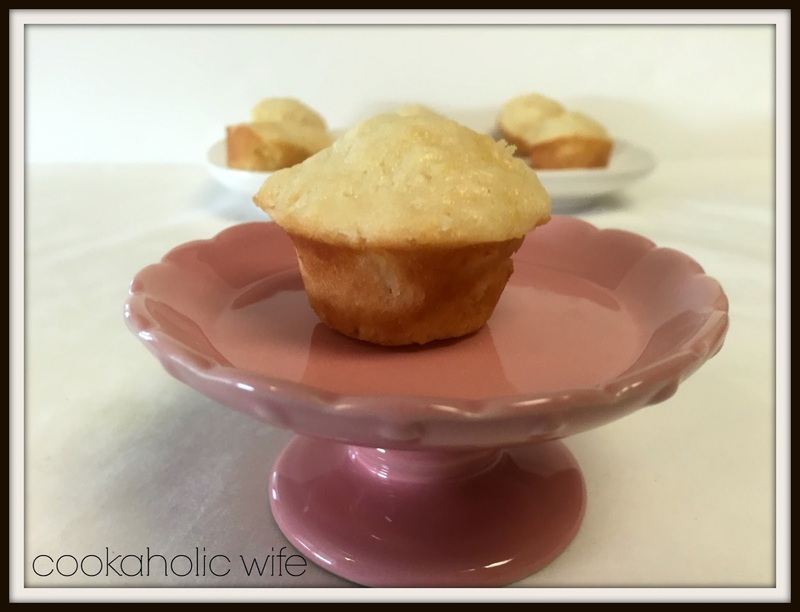 * I think there is a size difference between a mini muffin pan and a mini cupcake pan. I have a cupcake pan and got 48 of this mini muffins. Colleen listed hers as a mini muffin pan and ended up with 36 muffins, so depending on the actual pan you have, you may get more or less of these muffins. So you know how individual items, like muffins and cupcakes and whatnot are supposed to be great for portion control? Yeah…not these muffins. They’re so sweet and tasty that I found myself repeatedly popping them into my mouth. They taste like summer and tropical paradise, who could blame me? So glad you enjoyed these and thanks for the kind words! 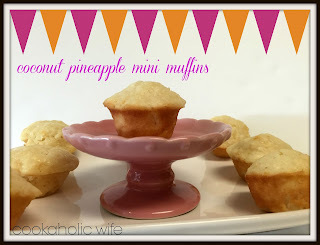 These muffins look delicious, I love the coconut and pineapple combination, yum! It's great cooking with you in the SRC! A Pina Colada muffin! These would taste like heaven! So fun and tropical! A perfect recipe for this month's SRC!